New Delhi/Hyderabad, Oct 31 (IANS) A. Revanth Reddy, who resigned last week from the Telugu Desam Party (TDP) and the Telengana assembly, on Tuesday joined the Congress in the presence of party Vice President Rahul Gandhi in New Delhi. Gandhi offered him sweets and a party scarf to formally admit him into the party. Congress Secretary R.C. Khuntia, incharge of party affairs in Telangana, and state Congress chief Uttam Kumar Reddy were also present. Several supporters of Revanth Reddy, including former legislator Seetakka, also joined the Congress. Revanth Reddy quit as TDP’s Telangana state Working President and also as MLA on Saturday. In his resignation letter to TDP President and Andhra Pradesh Chief Minister N. Chandrababu Naidu, he alleged that the party was “hobnobbing” with ruling Telangana Rashtra Samithi (TRS) while he was fighting it. He also complained of being sidelined in the TDP. Revanth Reddy’s move came a few days after he visited Delhi and met Rahul Gandhi. It is still not clear what post he will get in the Congress. 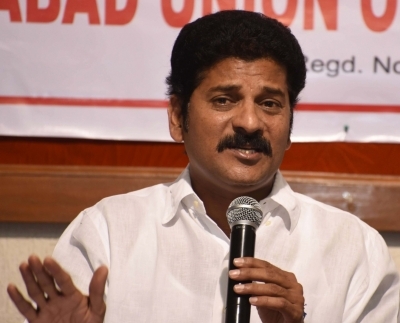 Revanth Reddy told his supporters that he will contest again from Kodangal constituency, which he won in 2009 and 2014.